The accommodation of MOWANA consists of a master stateroom with a double berth, the forward VIP cabin also with a double berth, the port side cabin which is a convertible double and the starboard cabin which is a fixed twin berth. All cabins are finished to the finest detail and all have full en-suite facilities, as well as flat screen TV’s and entertainment systems throughout. The exterior of the yacht is perfectly setup for entertaining, with a dining area aft and large sun pads and a seating area up on the foredeck, perfect for taking coffee in the morning sunshine. The expansive sundeck/ flybridge is great for soaking some sun or close the retractable canopy and enjoy a shady place to relax with your favourite book. With another large dining table and yet more sun pads there’s ample room for everyone to enjoy the view. 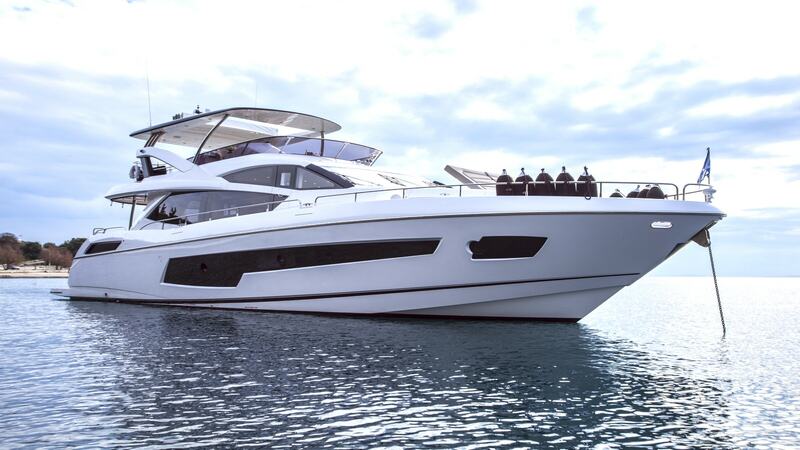 The flybridge is sure to be the hub of all activity onboard during your charter.With a Williams 385 jet tender and a superb range of water-sports toys available, including stand up paddle boards, wakeboard and waterskis there’ll be guaranteed fun for all the family on board.